While a mega studio blockbuster inhabited every cinema this past weekend a film of complete opposite DNA made itself quietly known. 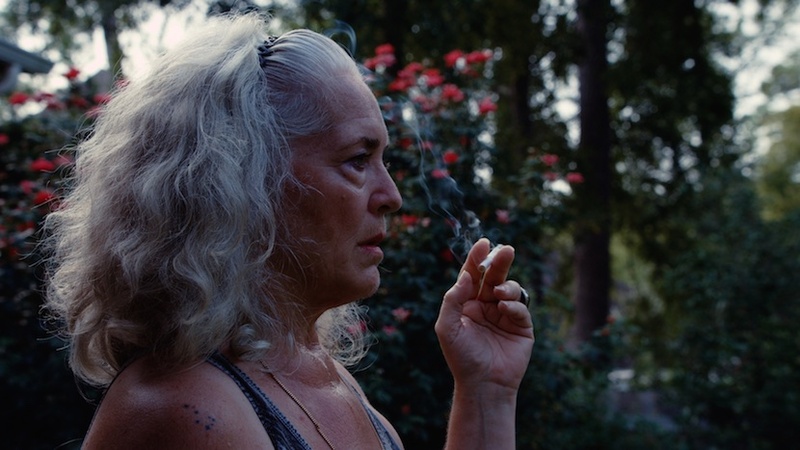 Krisha is Trey Edward Shults' debut feature and immediately signals the arrival of a distinct new artist. It's the story of Krisha, a woman who returns home for Thanksgiving to the family she once abandoned. She's played by Krisha Fairchild, Shults’ real life aunt and the story is based loosely on the family’s real life experience with a relative who was an addict. Krisha walks into her sister Robyn's home (Played by Shults’ mother, Robyn) around 60 years old looking like a shell of a hippie. The family tree, now blossoming with late 20's and 30 year old's, are essentially strangers. 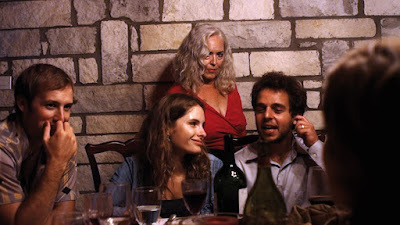 The poison of the past isn't initially acknowledged and instead Krisha assimilates back into her place with the family. She tries to prepare the turkey but runs into problems, sneaks outside for a smoke, and represses her emotions. Shults' editing and Brian McOmber's sneakily horrific score deliver everything we need to know about this woman. The aesthetic of the film is designed to create a texture and mood of alienation. While not "beautiful", this is one of the few times I've found digital aesthetic to work on a formal level while simultaneously accentuating the character and narrative. Shults openly admits the influence of the legendary John Cassavetes (A Woman Under the Influence is the template here) and Shults has indeed bottled that elusive brand of naturalism forgotten even in indie cinema. Shults and cinematographer Drew Daniels’ camera curiously wanders and observes. We see the family as they are, and the home video aesthetic heightens the familial tension and draws us in closer to Krisha's psychological crisis by creating a reality that feels startlingly raw. It's as if we're the ones recording Krisha with an iPhone. Of course the repressive horrors of the families past return in "grab your popcorn" moments of explosive confrontations. Imagine your worst family get together turned up to 11. The film marks the time in the life of a woman who’s trying to reach out to her family and make up for lost time while also working as a catharsis for Shults’ real family. The sense of despair and desire for acceptance is felt through interactions that grow decidedly more upsetting. As the film's family tree is set on fire we stick with Krisha's point of view and watch the disaster spread across the generations. Eventually it's hard to tell if the seed of forgiveness can even be planted. Shot around nine days at his parents’ house, and with family members as cast, this tale of a broken woman looking for roots to gain entry back into the family tree is undoubtedly one of the year's very best films and showcases perhaps the best female performance of the year from Krisha Fairchild. The extremely low budget shows at times and sometimes plays like a stretched out short film, but it's directed and acted with complete conviction to create an authentic exploration of a woman hidden in a cocoon waiting for catharsis. The school of Cassavetes has a new graduate. With Krisha's style of uneasy naturalism you might be fooled into thinking that you're watching one of those short films from the VHS horror anthology. I imagine Krisha may be mentioned in future film history books for its aesthetic, family actors and shoestring budget that will likely turn a solid profit. It's a film that arouses the feeling of old photographs, but in our digital internet age. We've got an entire generation being born that will grow up learning about their family through digital videos and Krisha is the first film I'm aware of that evokes family in the digital age.